Промышленная мембранная клавиатура 28 keys compact format ip65 dynamic membrane industrial keypad with industrial metal dome pcb electronics controller protected and shielded by stainless steel housing (usb,ps2,rs232,rs485), industrial metal dome pcb with gold-on-gold metal dome key switch technology with short stroke 0.45mm with extremely good tactile feeling for reliable data input, surface mounted extremely flush with anti-microbial functionalities, the fonts printed on the film underneath will never fade, durable and scratch-proof polyester withstand to most chemicals and liquids under the harshest environments, ruggedized and backed with 2.0mm aluminium plate with sand blasting & oxygenation treatment, with top panel mounted solution. Промышленная мембранная клавиатура 107 keys compact format ip68 dynamic rated membrane industrial keyboard with integrated numeric keypad and function keys on the upper line for easy operation, 2.0mm thickness industrial metal dome pcb with gold-on-gold metal dome key switch technology with short stroke 0.45mm with extremely good tactile feeling for reliable data input, with clean key for easy cleaning via lock/disable the entire keyboard without needing to take away the keyboard from pc, surface mounted extremely flush with anti-microbial, durable and scratch-proof polyester withstand to most chemicals and liquids under the harshest environments. movable stand alone desk top version with sealed aluminum metal housing with sand blasting & oxygenation surface treatment. Антивандальная металлическая клавиатура с защитой ip65 16 keys compact format ip65 dynamic vandal proof stainless steel industrial numeric keypad with industrial pcb electronics controller shielded & protected by stainless steel housing, industrial pcb with carbon-on-gold key switch technology with long stroke (2.0mm) with extremely good tactile feeling for fast and accurate data input without any noise, top stainless steel plate with sealing gasket for easy & tight sealing and mounting to enclosure or panel, with threaded bolts for top panel mounting solution. Антивандальная металлическая клавиатура с защитой ip65 description: 16 keys compact format ip65 dynamic water proof and vandal proof stainless steel industrial keypad with industrial electronics controller shielded & protected by stainless steel housing, with industrial pcb with carbon-on-gold key switch technology with long stroke (2.0mm) with extremely good tactile feeling for fast and accurate data input without any noise, stainless steel keys etched out via professional way and filled with transparent epoxy for backlight out，top stainless steel plate with welded studs and sealing gasket for easy tightly mounting to enclosure or panel.industrial usb, ps2, rs232 or rs485 optional, industrial backlight (red/blue/white/green) optional. Антивандальная металлическая клавиатура с защитой ip65 16 keys compact format ip65 dynamic waterproof and vandal proof stainless steel industrial numeric keypad with industrial metal dome pcb electronics controller shielded & protected by stainless steel housing, industrial metal dome pcb with gold-on-gold key switch technology with short stroke 0.45mm with excellent tactile feeling for stable and accurate data input, top stainless steel plate for top panel mounted. Антивандальная металлическая клавиатура с защитой ip65 43 keys compact format ip65 dynamic vandal proof stainless steel industrial numeric keypad with industrial metal dome pcb electronics controller shielded & protected by stainless steel housing, industrial metal dome pcb with gold-on-gold key switch technology with short stroke 0.45mm with excellent tactile feeling for stable and accurate data input, with mounting holes on rear stainless steel plate for panel mounting. Антивандальная металлическая клавиатура с защитой ip65 16 keys compact format ip65 dynamic vandal proof stainless steel industrial numeric keypad with industrial metal dome pcb with socket on the back for connecting electronics controller, industrial metal dome pcb with gold-on-gold key switch technology with short stroke 0.45mm with excellent tactile feeling for stable and accurate data input, stainless steel key caps etched out via special professional way and filled with transparent epoxy for backlight out, industrial backlight included, (red/blue/white/green optional), top stainless steel plate with sealing gasket for easy & tight sealing and mounting to enclosure or panel, with threaded bolts under top stainless steel plate for top panel mounting solution. 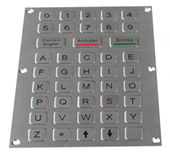 Антивандальная металлическая клавиатура с защитой ip65 18 keys compact format ip67 dynamic waterproof vandal proof stainless steel industrial matrix keypad, industrial dot matrix numeric keypad with industrial metal dome pcb with socket on the back for connecting electronics controller, industrial metal dome pcb with gold-on-gold key switch technology with short stroke 0.45mm with excellent tactile feeling for stable and accurate data input, stainless steel key caps etched out via special professional way and filled with transparent epoxy for backlight out, with industrial backlight included.top stainless steel plate with threaded bolts for top panel mounting solution. DWP металлическая клавиатура или кейпад 12 keys ip67 dynamic vandal proof dot matrix keypad with durable polymer keys and nvis-compliant backlight included, with fully sealed matrix pcb with carbon-on-gold key switch technology with 2.0mm long stroke with extremely good tactile feeling for fast and accurate input without any noise, matrix pcb with socket on the back for connecting electronics controller, top original stainless steel plate with water-tight gasket for easy sealing and tightening with cabinet, and threaded bolts under top original stainless steel plate for top panel mounting solution. which is good for outdoor application with direct rain and very harsh environments with humidity, much dynamic water, oil, dirt, salt mist etc, no rust risk and anti-salt spray corrosion. Антивандальный указатель мыши с защитой IP65 ip65 static rated vandal proof stainless steel industrial trackball with ip65 static 38mm stainless steel mechanical trackball module with 400 dpi resolutions, trackball module protected and shielded by stainless steel housing, with movable stand alone desk top version or mountable stand alone desk top versions with stainless steel housing. Антивандальный указатель мыши с защитой IP65 ip65 dynamic rated vandal proof stainless steel industrial trackball with ip68 dynamic washable 38mm laser trackball module with 1200 dpi resolutions for fast and accurate fixing cursor position with extreme smooth operation without any noise, with industrial pcb with carbon-on-gold key switch technology with long stroke (2.0mm) with extremely good tactile feeling for fast and accurate data input without any noise, 3 mouse buttons designed for right & left clicking and scrolling up and down with ball rolling, stainless steel top plate with threaded bolts for top panel mounting solution. Антивандальный указатель мыши с защитой IP65 ip68 38mm track ball, 1200 dpi, 2.0mm key stroke. Антивандальный указатель мыши с защитой IP65 ip65 dynamic sealed and ruggedized tough touchpad with scroll function (optional) for fast and accurate cursor position,industrial pcb with carbon-on-gold key switch technology with long stroke (2.0mm) with extremely good tactile feeling for fast and accurate data input without any noise, with numeric keypad integrated, stainless steel top plate with threaded bolts for top panel mounting solution. Антивандальный указатель мыши с защитой IP65 ip65 dynamic rated vandal proof stainless steel optical trackball with ip65 dynamic sealed & ruggedized stainless mouse buttons and ip68 dynamic rated washable 38.0mm stainless steel optical trackball module with +800 dpi resolutions for fast and accurate fixing cursor position with extreme smooth operation without any noise, optical trackball module protected and shielded by stainless steel housing, 3 sealed stainless steel mouse buttons designed for right & left clicking and scrolling up and down with ball rolling,with rear panel mounting solution. Антивандальный указатель мыши с защитой IP65 ip65 dynamic sealed and ruggedized tough touchpad for fast and accurate cursor position, with 2 raised ip65 dynamic sealed stainless steel mouse buttons under touchpad, the electronics controller module shielded and protected with stainless steel housing,high quality durable black titanium electroplated on the top stainless steel plate, stainless steel top plate with threaded bolts for top panel mounting solution. Антивандальный указатель мыши с защитой IP65 ip65 static rated vandal proof stainless steel industrial trackball with ip65 static 38mm stainless steel mechanical trackball module with 400 dpi resolutions, trackball module protected and shielded by stainless steel housing, 3 mouse buttons designed for right & left clicking and scrolling up and down with ball rolling, rear panel mounted. Металлическая клавиатура под черный титан ip65 static rated vandal proof stainless steel industrial trackball with ip65 static 38mm stainless steel mechanical trackball module with 400 dpi resolutions, trackball module protected and shielded by stainless steel housing,high quality durable black titanium electroplated on the top stainless steel plate with rear stainless steel panel mounted. Антивандальный указатель мыши с защитой IP65 ip65 dynamic sealed and ruggedized tough touchpad for fast and accurate cursor position, with 2 raised stainless steel mouse buttons under touchpad, the electronics controller module shielded and protected with stainless steel housing, with mounting holes along the rear panel mounting aluminium plate for rear panel mounting. Металлическая клавиатура без мыши 47 keys ip65 static vandal proof stainless steel industrial keyboard with industrial pcb with carbon-on-gold key switch technology with long stroke (2.0mm) with extremely good tactile feeling for fast and accurate data input without any noise, with rear mounting solution. Металлическая клавиатура с мышью mini 68 keys ip65 static rated compact format vandal proof stainless steel industrial keyboard with ip65 static rated 25mm stainless steel mechanical trackball module with +400 dpi resolutions for accurate cursor position,industrial metal dome pcb with gold-on-gold key switch technology with short stroke 0.45mm with excellent tactile feeling for stable and accurate data input.3 mouse buttons designed for right & left clicking and scrolling up and down with ball rolling, high quality durable black titanium electroplated on the top stainless steel plate optional, with rear panel mounting solution. Металлическая клавиатура под черный титан mini 68 keys ip65 static rated compact format vandal proof stainless steel industrial keyboard with ip65 static rated 25mm stainless steel mechanical trackball module with +400 dpi resolutions for accurate cursor position,industrial metal dome pcb with gold-on-gold key switch technology with short stroke 0.45mm with excellent tactile feeling for stable and accurate data input.3 mouse buttons designed for right & left clicking and scrolling up and down with ball rolling, high quality durable black titanium electroplated on the top stainless steel plate included, with rear panel mounting solution. Металлическая клавиатура без мыши 66 keys compact format ip65 static vandal proof stainless steel industrial keyboard with industrial pcb with carbon-on-gold key switch technology with long stroke (2.0mm) with extremely good tactile feeling for fast and accurate data input without any noise , with rear panel mounting solution. Настольная металлическая клавиатура 77 keys compact format ip65 static vandal proof stainless steel industrial keyboard,industrial pcb with carbon-on-gold key switch technology with long stroke (2.0mm) with extremely good tactile feeling for fast and accurate data input without any noise, function keys f1, f2, f3…f10, f11, f12 are on the top line for easy operation. movable stand alone desk top version, or mountable desktop with mounting holes on the bottoms for fixing. Металлическая клавиатура с мышью 67 keys compact format ip65 static vandal proof stainless steel industrial keyboard with ip65 dynamic sealed & ruggedized tough touchpad with scroll function (optional) for fast and accurate cursor position, one compete silicone rubber along mounting aluminum plate for easy mounting & sealing tightly with cabinet,industrial pcb with carbon-on-gold key switch technology with long stroke (2.0mm) with extremely good tactile feeling for fast and accurate data input without any noise, rear panel mounting solution. Металлическая клавиатура с мышью 68 keys compact format ip65 static vandal proof stainless steel industrial keyboard with ip65 dynamic sealed & ruggedized tough touchpad with scroll function (optional) for fast and accurate cursor position, industrial pcb with carbon-on-gold key switch technology with long stroke (2.0mm) with extremely good tactile feeling for fast and accurate data input without any noise, stainless steel top plate with threaded bolts for top panel mounting solution. Настольная металлическая клавиатура 81 keys compact format ip65 static sealed and ruggedized vandal proof stainless steel industrial keyboard with ip65 dynamic sealed & ruggedized tough touchpad with scroll function (optional) for fast and accurate cursor position, functional keys f1, f2, f3…f10, f11, f12 are on the top line for easy operation, industrial metal dome pcb with gold-on-gold key switch technology with short stroke 0.45mm with excellent tactile feeling for stable and accurate data input, movable stand alone desk top version, or mountable desktop with mounting holes on the bottoms for fixing. Металлическая клавиатура с мышью 69 keys ip65 static vandal proof stainless steel keyboard with ip65 static 38.0mm mechanical trackball module with 400 dpi resolutions, industrial pcb with carbon-on-gold key switch technology with long stroke (2.0mm) with extremely good tactile feeling for fast and accurate data input without any noise, one compete silicone rubber along mounting aluminum plate for easy mounting & sealing tightly with cabinet, 3 mouse buttons designed for right & left clicking and scrolling up and down with ball rolling, rear panel mounting solution. Металлическая клавиатура с подсветкой 84 keys compact format ip65 static vandal proof stainless steel industrial keyboard with ip65 static rated 38mm transparent mechanical trackball module with touch changeable chameleon backlight and 400 dpi resolutions, industrial pcb with carbon-on-gold key switch technology with long stroke 2.0mm with extremely good tactile feeling for fast and accurate input without any noise, numeric keypad (optional pinpad with encryption electronics controller supporting des/tdes), 3 mouse buttons designed for right & left clicking and scrolling up and down with ball rolling, with rear panel mounting solution. stainless steel key caps etched out via special professional way and filled with transparent epoxy for backlight out, with adjustable industrial backlight included. (blue, red, white colors etc. optional). Металлическая клавиатура с мышью 69 keys ip65 static vandal proof stainless steel industrial keyboard with ip65 static 38.0mm stainless steel mechanical trackball module with 400 dpi resolutions, industrial metal dome pcb with gold-on-gold key switch technology with short stroke 0.45mm with excellent tactile feeling for stable and accurate data input, 3 mouse buttons designed for right & left clicking and scrolling up and down with ball rolling, rear panel mounting solution. Металлическая клавиатура с мышью 67 keys ip65 static vandal proof stainless steel industrial keyboard with ip65 dynamic sealed & ruggedized tough touchpad with scroll function (optional) for fast and accurate cursor position, industrial metal dome pcb with gold-on-gold key switch technology with short stroke 0.45mm with excellent tactile feeling for stable and accurate data input, rear panel mounting solution. Металлическая клавиатура с мышью 69 keys ip65 static vandal proof stainless steel industrial keyboard with ip65 static 38.0mm mechanical trackball module with 400 dpi resolutions, industrial pcb with carbon-on-gold key switch technology with long stroke (2.0mm) with extremely good tactile feeling for fast and accurate data input without any noise, 3 mouse buttons designed for right & left clicking and scrolling up and down with ball rolling, top panel mounting solution. Металлическая клавиатура под черный титан 69 keys ip65 static vandal proof stainless steel industrial keyboard with ip65 static 38.0mm mechanical trackball module with 400 dpi resolutions, industrial pcb with carbon-on-gold key switch technology with long stroke (2.0mm) with extremely good tactile feeling for fast and accurate data input without any noise, 3 mouse buttons designed for right & left clicking and scrolling up and down with ball rolling, top panel mounting solution. Настольная металлическая клавиатура 97 keys compact format ip65 sealed and ruggedized dynamic vandal proof stainless steel industrial keyboard with full keyboard functionalities, with ip65 dynamic sealed & ruggedized tough touchpad with scroll function (optional) for fast and accurate cursor position, function keys f1, f2..f10, f11, f12 are on the top line for easy operation, numeric keypad (optional pinpad with encryption electronics controller supporting des/tdes), industrial metal dome pcb with gold-on-gold key switch technology with short stroke 0.45mm with excellent tactile feeling for stable and accurate data input, movable stand alone desk top version, or mountable desktop with mounting holes on the bottoms for fixing. Указательное устройство ip67 dynamic rated waterproof & rugged force sensing resistor pointing device integrated in one-piece compact seamless silicone cover for fast and accurate cursor position, with 2 mouse buttons for left and right clicking, and with mounting holes along for easy mounting & sealing, which is good for much oil, water, sand etc application or gloves are needed when operation. usb interface.dimensions: 76.0mm x 32.6mm x 8.6mm (l x w x h).